You really don’t want to buy a teeth whitening product without reading this. If you can spare a few more minutes we have lots of additional content on the subject of teeth whitening created by our in house dentist, which we know you will find useful. Blanx White Shock Formula works by removing surface stains and may make your teeth appear whiter, but it will not change the natural colour of your teeth. The results you achieve by using Blanx will be different to what I can achieve. I have tried many different products but have little to no staining on my teeth. The cost will depend upon when and where you are looking to buy the paste from. I am testing 2 different products, albeit the same formula. At the time of review, the 50ml tube of paste with LED was available for as little as £5.62, with the average selling price tending to be £6-7.50 for this option. The 75ml tube without the LED was available from Boots for just £3.75 as part of a promotion, with the typical selling price being somewhere between £4-5. Available from some high street stores, it can also be purchased online at Amazon and directly from Blanx own website, although buying direct is generally the most expensive route. We’ve included a live price comparison below of online retailers currently stocking it. 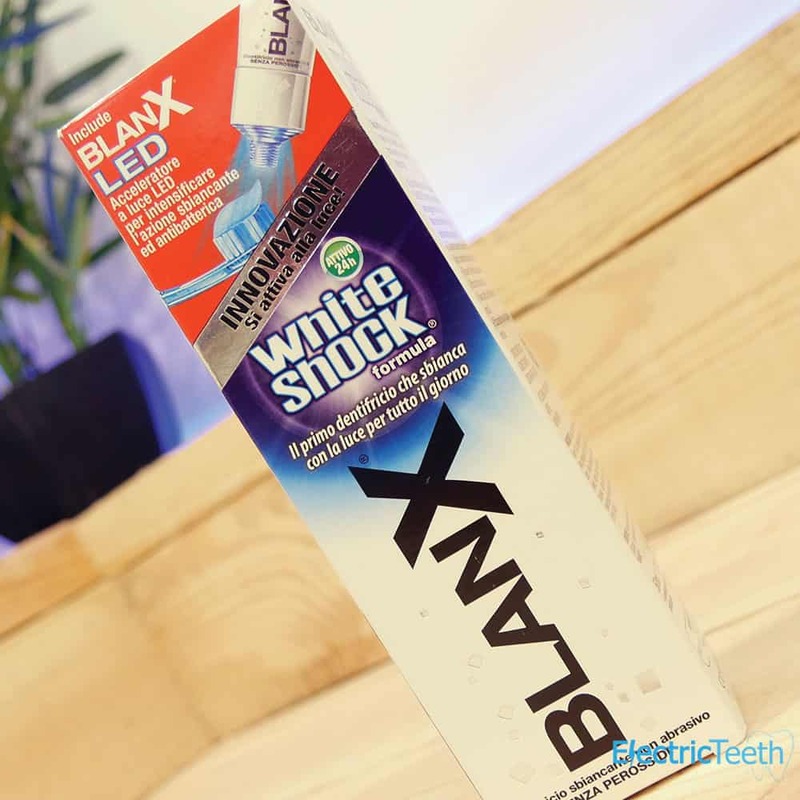 The core focus of this review is on the White Shock toothpaste produced by Blanx, but before I get into all the details on what it is like to use, I just wanted to make mention of other products on offer from the company. Blanx is actually a brand from Italian company Coswell which makes all sorts of products for the healthcare market through to the food industry. At the time of review, all of the products under the Blanx brand are focused on tooth whitening. 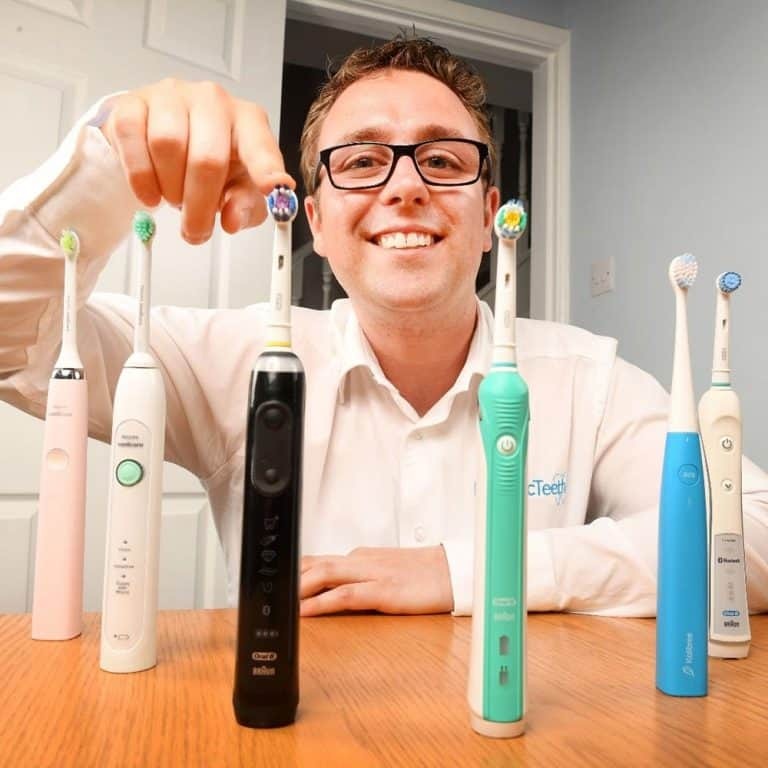 This is not a problem in itself, but as outlined at the start of this article tooth whitening is a confusing topic and the reality is none of their products actually whiten the teeth, they only remove stains. Surface stains can build up, on the exterior surface of the teeth and cause them to look discoloured. When removed, the teeth can appear whiter, but in fact, what is being revealed is your natural tooth colour that has been hidden or dulled by the satins. Unless a product contains a bleaching agent such as carbamide or hydrogen peroxide it will not change the tooth colour. Blanx products do not contain any bleaches or peroxides. Blanx does have one product called ‘Blanx Intensive Stain Removal’, but the reality is all their pastes are stain removal products, not just that one they name as such. Not everyone has stains on their teeth. Therefore the results will be different for everyone. Hopefully, this explains the differences a little and helps you understand whether this will be useful for you or not. The 50ml tube comes with an LED attachment. This LED shines on the paste as it leaves the tube and activates the ActiluX ingredient within the paste. ActiluX is a special molecule, specifically titanium dioxide hydroxyapatite. When light is shone onto this molecule (i.e. the toothpaste), the molecule reflects that light to give a shiny white appearance. This LED module can also attach to the 75ml tube of paste. The larger 75ml tube is essentially designed as a refill to the 50ml. The idea is you first buy the 50ml tube with the LED light and then once finished, retain the LED but buy and fit the 75ml tube to the LED. This is great in principle but the packaging does not make it all that clear. You can, of course, use the paste without the LED module. The packaging of this paste is a bit busy compared to similar toothpaste. The Blanx product name is bold and the graphics do catch the eye. There is less of a clinical look and feel to the box and the tube itself. Both English and Italian wording featured on the packaging. No issue with this, but I think this adds to the issue of how busy the packaging is. Inside was a small document that tells you how to use the paste whilst also advertising a separate item the company sells, the Blanx White Shock LED Bite product. Printed in colour the document has the two languages and was quite informative with some FAQ’s answered. It explains how the paste includes Actilux, that reacts to light and how the provided LED is an accelerator designed to activate the paste, more on this shortly. Both the 50ml and 75ml have a foil safety seal installed on the end of the tube that needs to be removed before use. Both also have screw caps. The 75ml can stand upright on the screw top, but the 50ml can’t. Attach the LED module to either tube and both stand upright. Normally I prefer a flip lid, but in this instance, I see why a screw top has been used, it is all to do with the design of the LED module. The LED module is made up of two parts. First, you have what I can only explain as a thicker and extended nozzle to the tube of paste. In here is the LED light and electronics needed to provide the blue light. Unscrew the white cap, the second part to this module, and as you do it releases the pressure on a small switch. Once the pressure is released, the LED is activated and a blue light shines from within the clear nozzle. It is this blue light that accelerates the reaction to light as the paste is pushed out of the tube. You can also shine this light onto the teeth for 1 minute post brushing, to further accelerate the effectiveness. Inside this module must be a battery that powers the LED. I would imagine it would last for a long time, how long, I don’t really know. As the screw cap is replaced and tightened, a pressure is applied to the light switch to turn the blue light off. The paste itself is quite a strong blue colour and has quite a strong smell to it. There is a minty hint to the taste also. Both the 50 & 75ml tube should be used within 12 months of opening if you decide to use it. The 75ml tube should last about 3 months with the 50ml tube lasting approximately 2 months, based on everyday use. I experienced no sensitivity or abnormalities when brushing with Blanx, but should you do so, stop using and consult your dentist. The 50ml tube of paste with LED has an average selling price tends to be £6-7.50, whilst the 75ml tue without the LED is between £4-5. This is not bad value, sitting somewhere between the cost of everyday pastes and the premium whitening toothpastes such as Nu Skin AP24. There are no specific claims made by the packaging as to how quickly you will notice the effects or by when your teeth will be whiter. This is a good thing as it does not set unrealistic expectations. It is suggested the whitening process begins working right away, which is, of course, true if you have stains that can be removed. The suggestion is made that the paste is not abrasive and safe for everyday use by adults and children alike. This may well be the case, but avoid having children use whitening pastes. In fact you and your children will be better off sticking with a good fluoride based toothpaste, especially when you consider that a recent investigation by a UK TV programme called It’s also worth Supershoppers, found that there is little difference between the amount of stains removed by a whitening toothpaste compared to a regular tube of toothpaste. Take a look at our ingredients section below to learn more about what is in this toothpaste. I don’t want to get bogged down in the science, but here are a few overarching comments based on what is included and how they work. Actilux, this special formulation in the paste is actually ‘Titanium Dioxide Hydroxyapatite Cluster’. Essentially then, this Blanx works by reacting to and refracting light to give the impression of whiter teeth. A bit like shining a light at a mirror, the mirror reflects the light back. Hence the LED included with the paste. Natural as well as artificial light is supposed to work, and exposing your teeth to light for longer will further help this whitening to be achieved. The time for which this enhancement from the light lasts will vary from one person to another. Titanium Dioxide is a common inclusion in toothpaste, but I feel that Blanx is perhaps overplaying the inclusion compared to other manufacturers, especially given the concerns (1 & 2) over its inclusion. Maybe this is my cynical view that you and I as consumers are being cheated or misled by the creators of Blanx. but there is some evidence of this. Perhaps not intentionally looking to get in trouble an advert for Blanx was referred to the Advertising Standards Agency who upheld the complaints raised. Actilux is claimed to be a light-activated tooth whitener, but I cannot find any sound scientific evidence to confirm it works. This paste contains isopropyl alcohol and benzyl alcohol – alcohol has traditionally been used in oral hygiene products to give a fresh sensation, but most manufacturers are removing it because of possible links with oral cancer. But this paste also contains fluoride and xylitol, both proven to reduce decay. Fluoride strengthens tooth enamel and xylitol helps prevent bacteria sticking to teeth. He ultimately rates it 3/10. Dr Guyver mentions some of the ingredients that are perhaps questionable, but there are a few others also, Sodium Lauryl Sulphate (SLS) being just one example. The inclusion of this and other items are contentious because of the possible health implications. It is not necessarily right or wrong to include these. It just depends on your viewpoint. It does contain fluoride which most dentists advise. 1450ppm fluoride is the recommended dose in toothpaste by dental professionals. Ultimately then, Blanx is not the best when it comes to ingredients and the result is a little bit of an illusion. There is nothing wrong with this if you are happy to work with this perceived whitening approach. I just can’t help but think your time and money would be better spent ensuring you are brushing correctly, getting a scale and polish from the dentist and maybe cosmetic tooth whitening if you want it, the results are going to be more effective and longer lasting. On the whole, there is little to be really concerned about when it comes to the safety of this toothpaste. There are many ingredients within the paste, some of which are met with more acceptance than others. It depends primarily on your school of thought and what studies and data you want to follow. I am not taking either side of the argument for any of these, but some more than others are contentious and you may wish to avoid. This paste is not designed to be eco-friendly and no such claims are made. Sadly toothpaste tubes can’t easily be recycled, this is a global issue and something I would like to see worked on considering plastic and waste, in general, is such a big issue. What is more concerning is the inclusion of the LED light. It is not entirely necessary. I know why Blanx includes it, but I can see many of these being thrown away, with the battery built-in still inside and going to landfill rather than more appropriately being recycled or disposed of in a more considerate fashion. I also feel hat the battery will quite likely still have usable life left in it and although the LED module is able to be moved and fitted to other tubes of paste, I am not entirely sure it will be. The brand manufacture and market a number of other toothpastes and a whitening kit. Just like the white shock formula being reviewed here, all of these products are stain removal items. This means they may make the teeth look whiter, by removing staining and discolouration that exists on the outside surface of the teeth. No product will change the natural colour of the teeth. What I would like to see improved with Blanx is something that I want of most brands who produce ‘whitening’ pastes. I want them to be clearer that the paste is a stain removal product that will give a perceived whitening, rather than an actual whitening product that changes the colour of the teeth. It is a confusing topic and not easy to get across in the sales and marketing material, particularly when everyone’s teeth and expectations are different. The LED light gives a unique sales proposition for Blanx as a toothpaste as I have not seen many offering this. But, pick up another whitening paste with Titanium Dioxide, shine a light at it and in most instances, you will get a similar whitening effect. The whitening effects of Blanx are a little overplayed in my opinion. Intentionally or not, this ActiluX formula is perhaps not as special as is made out. Basing much of the results on the perceived whitening, aided by the LED light, you are going to in most instances, even with staining on your teeth sticking with a fluoride toothpaste or another stain removal paste that doesn’t make use of the LED light. The ActiluX present in BlanX White Shock formula is deposited on the surface of your teeth and remains active throughout the day. 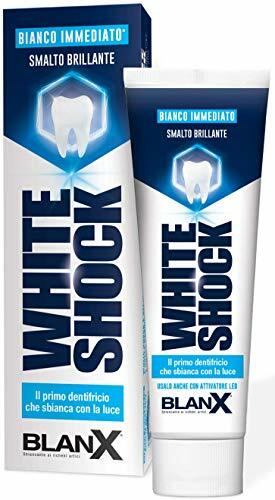 Where can I buy Blanx White Shock Formula Toothpaste With LED? High street chemists like Boots and Superdrug as well as grocery stores like Tesco amongst online outlets such as Amazon. It has a cool mint flavour which does not last or as long as I would like to post clean. Freshness for me lasted about an hour. Approximately 2-3 months based on 2 pea sized amounts being used each day and depending on tube size. 2 months for the 50ml and 3 months for the 75ml. Do you own or have you used the Blanx White Shock Formula?